Mr. Raza Rumi is a leading Pakistani journalist and policy analyst who is currently a writer in residence at Ithaca College. He serves as a consulting editor of the Friday Times, Pakistan’s foremost liberal weekly paper, and as a columnist for Pakistan’s Express Tribune. 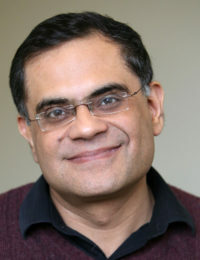 A consistent voice for human rights and social inclusion, he has worked as executive director of the Justice Network, a coalition of Pakistani civil society organizations, as director of the Jinnah Institute, a NED-supported think tank that explores issues of democracy and governance, and as host of current affairs talk shows on Capital TV and Express News. An acclaimed writer, he is the author of two books, The Fractious Path: Pakistan’s Democratic Transition (2016) and Delhi by Heart: Impressions of a Pakistani Traveler (2013). During his fellowship, Mr. Rumi is working on a book manuscript exploring the 2007 Lawyers’ Movement in the context of Pakistan’s democratic development. “Sabeen Mahmud, Martyr for Free Speech,” The New York Times, April 29, 2015. “Xi Jinping Plans to Fund Pakistan,” The New York Times, April 21, 2015. George Washington University, “Democracy and Extremism in South Asia: A Conversation with Raza Rumi,” April 22, 2015. National Endowment for Democracy, “The Story of a Banyan Tree: 9000 Years of Spiritual Heritage of Pakistan,” May 4, 2015.